Join us as we travel to Lincoln NH for a fun filled day of snow tubing, snowshoeing and a visit to the Lincoln NH Ice castle. Lunch will be on your own at Gordi's (great place for fish and chips). When we arrive at Loon Mountain, you will have a choice of going snow tubing or going on a guided snowshoe walk. 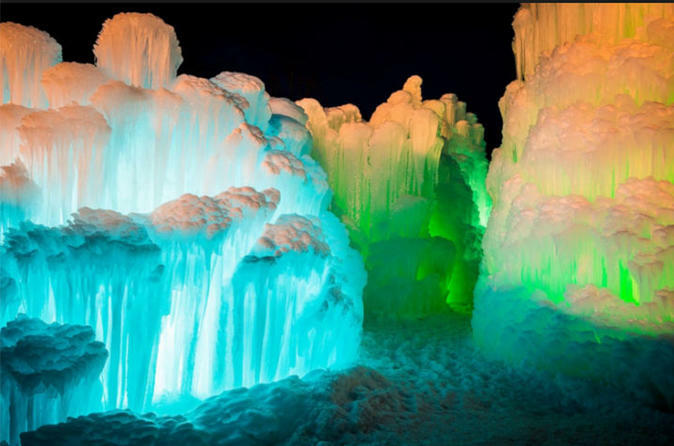 In the afternoon, we will visit the Lincoln Ice Castle. Join us as we travel to Lincoln NH for a fund filled day of snow tubing, snowshoeing and a visit to the Lincoln NH Ice Castle. We will continue north where lunch will be on your own at Gordi's (great place for fish and chips). When we arrive at Loon Mountain, we will divide into two groups. Those that want to go snow tubing and those that want to go on a guided snowshoe walk. Snowshoe adventure beginners level. Snowshoeing is a great way to explore Loon's variety of cross-country trains and get some fresh air and exercise. Guided toors, rental equipment and instructions are included. Tour the trails that wander along the Pemigewasset River. Snow Tubing: An exciting way to slide on snow. Who says you need to ski or snowboard to have fun in the mountains? Tubing offers all the thrills of sliding down a mountain without any learning curve!